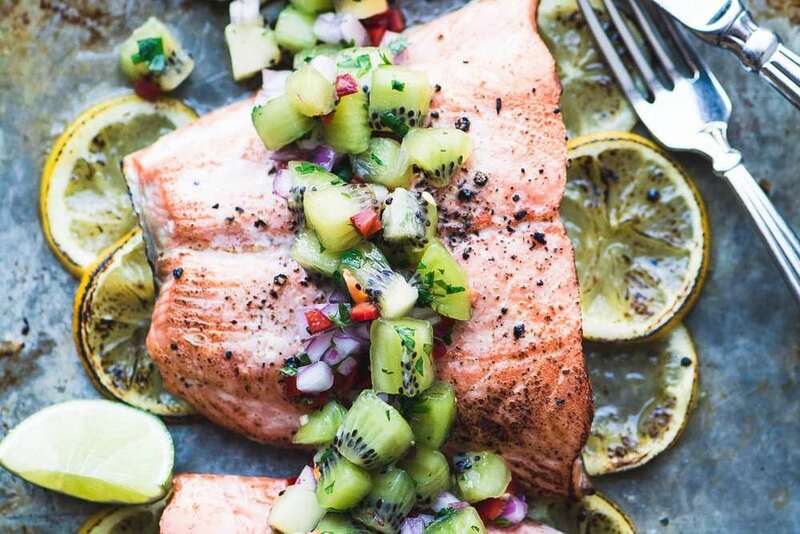 Roasted Salmon with Kiwi Salsa is a vibrant 30 minute healthy meal with tons of tropical flavor ~ make it on the grill or in the oven! Peel the kiwi, trim lends, and cut in small 1/4 inch dice. Put in a bowl. Cut the onion slice in a 1/4 inch dice and add to bowl. Mince the red pepper and add to bowl along with the cilantro and lime juice. Toss well, cover, and refrigerate until needed. Line a sheet pan with parchment and arrange the salmon filets on it. Tuck the lemon slices under the edges of the filets. Season with salt and pepper, and drizzle with olive oil. I sometimes dot with butter if I'm feeling extravagant. (If you use salted butter cut the amount of salt you use to season the fish.) Roast or grill the fish for 20 -25 minutes, or until it flakes with a fork and is not longer dark pink inside. Serve the salmon topped with a generous amount of kiwi salsa.